Both the NYT (Charlie Savage and Mark Mazzetti) and WSJ (Siobhan Gorman, Devlin Barrett, and Jennifer Valentine-Devries) tell the same story today: the CIA is collecting bulk data on international money transfers. Given that someone has decided to deal this story to two papers at the same time, and given the number of times the Administration has pre-leaked stories to Gorman of late to increasingly spectacular effect (even making most national security journalists forget the very existence of GCHQ’s notoriously voracious taps at cable landings just off Europe) I assume this may be some kind of limited hangout. It’s not that I doubt in the least that CIA gets and uses financial data. I don’t even doubt the government uses PATRIOT authorities to do so (as both stories assert). But it would be unlikely that this data comes in through an FBI order and does not also get shared with Treasury and National Counterterrorism Center (if not NSA), both of which would have better infrastructure for analyzing it, and both of which we know to use such data for their known intelligence products. Indeed, in response to a question from both papers about this practice Western Union points to Treasury programs. A spokeswoman for one large company that handles money transfers abroad, Western Union, did not directly address a question about whether it had been ordered to turn over records in bulk, but said that the company complies with legal requirements to provide information. And at WSJ a consultant to the industry points even more firmly towards Treasury. Money-transfer companies are “highly, highly aware of their obligations under the Patriot Act,” said Robert Pargac, a director in global investigations and compliance at Navigant Consulting Inc. who has worked at several such companies. Western Union said last month it would be spending about 4% of its revenue in 2014 on compliance with rules under the Patriot Act, the Treasury Department’s Office of Foreign Assets Control and other anti-money-laundering and terrorist-financing requirements. We know that, at least until 2008, the FBI maintained that it could share materials that came in through Section 215 with any agency so long as that agency asserted it had a need for the information, and there’s little reason to believe the FBI has changed that policy. 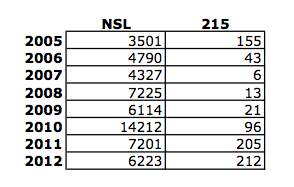 So I would assume at least Treasury and NCTC gets this data as well. It may be all this story indicates is that — as they do with much Section 702 data — CIA gets its own access to the data. That’s a minimization story, not a collection story, because we’ve known this data was collected (as WSJ points out). According to Reuters, the Treasury Department is planning on expanding access to FinCEN reports — which include Suspicious Activity Reports from over 25,000 financial institutions — to the intelligence community, including CIA. The Treasury document outlines a proposal to link the FinCEN database with a computer network used by U.S. defense and law enforcement agencies to share classified information called the Joint Worldwide Intelligence Communications System. 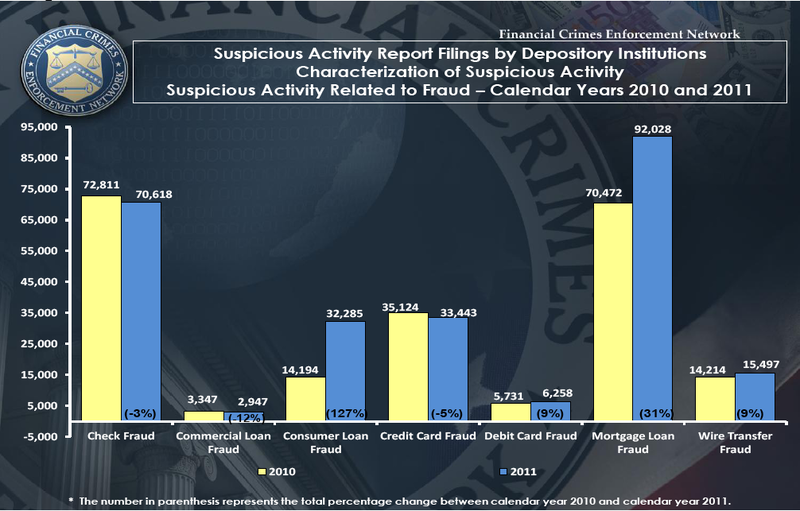 More than 25,000 financial firms – including banks, securities dealers, casinos, and money and wire transfer agencies – routinely file “suspicious activity reports” to FinCEN. The requirements for filing are so strict that banks often over-report, so they cannot be accused of failing to disclose activity that later proves questionable. This over-reporting raises the possibility that the financial details of ordinary citizens could wind up in the hands of spy agencies. First, when I made fun of John Brennan’s confirmation vow, people assured me CIA doesn’t operate in the US. Maybe not. But now they have free access to all this data on Americans. And remember that DOJ, as far back as 2002, argued it was legitimate to use FISA to collect information on crimes the government could use to coerce people into becoming informants. Imagine how much easier that will be with access to people’s bank irregularities. Finally, think of the security nightmare here. While I doubt anyone is going to leak a whole database of FinCEN data to WikiLeaks (though how much fun would that be?!?! ), I can imagine a lot of people might avail themselves of this access to profit off the financial information. Maybe that’s how CIA will fund their ops, instead of (or inaddition to?) drug running: profiting off sensitive financial information. There’s a whole slew of reasons why this is a bad idea. Which is precisely why it is bound to be pushed through regardless. In February, here’s what Jennifer Shasky Calvery said in testimony before a House Subcommittee. These staggering amounts of money in the hands of some of the worst criminal elements create a terrifyingly vicious cycle – money enables [the crooks] to corrupt the economic and political systems in which they operate, thereby allowing them to consolidate and expand their power and influence, which gives rise to more opportunity to commit crime and generate revenue. Mind you, I’m cherry picking a quote from testimony about Transnational Crime Organizations. But it shows the blindness DOJ (and the Administration generally) have had as they try to repurpose their counter-terrorism tools to combat transnational crime: to some extent, what’s true of drug cartels is also true of the banks that have escaped prosecution even while doing as much damage as the drug cartels. And yet we never get around to prosecuting our own transnational criminal organizations, the banks. It’s worth keeping in mind, now that Shasky Calvery takes over at Treasury’s FinCEN, the part of the Agency that makes sure corporations are complying with reporting requirements of suspected financial crimes. The other day, I noted how–days after his department reported that suspected bankster crimes are growing quickly and terrorist financing crimes are going down–Treasury Department fired FinCEN head, Jim Freis. Given some of the reporting describing the firing, which explained that Treasury wanted to focus on things like terrorist financing whereas Fries had been focusing on things like mortgage fraud, I wondered whether Treasury fired Freis, in part, for showing that the emphasis on terrorism resulted in the neglect of bankster crimes. 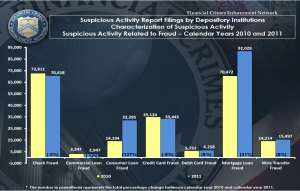 Today, FinCEN sent out notice of a survey to determine how useful that report and another yearly report–on Tips and Trends–they produce are (note, the email notice says an invitation to the survey is here, but as of 8:15 it is not). 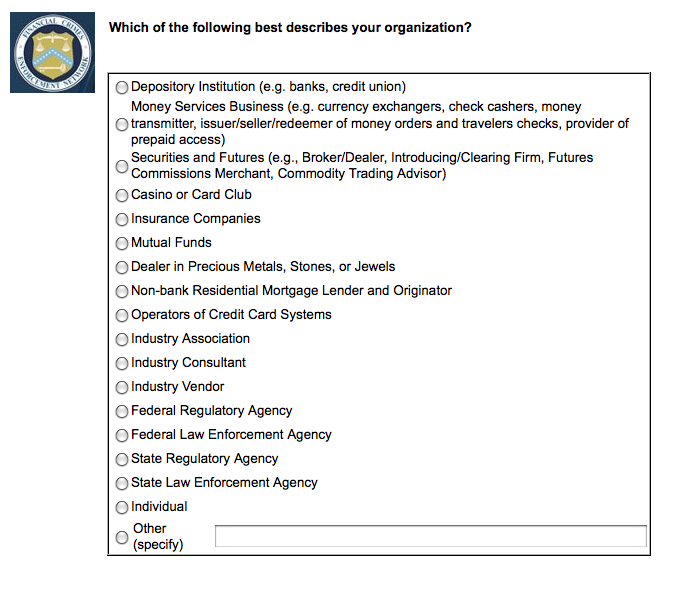 To participate in this completely voluntary survey, please click on the following link: https://svy.cfigroup.com/cgi-bin/qwebcorporate.dll?idx=HWGKEN Please note that this link will direct you to a website hosted by the CFI Group, which FinCEN has commissioned to conduct this survey. FinCEN has obtained permission from the Office of Management and Budget through control number 1090-0007 to conduct this survey in accordance with the Paperwork Reduction Act (44 U.S.C. § 3501-3520) and its implementing regulations (5 C.F.R. Part 1320). Through the survey, we hope to learn more about your needs and identify opportunities to improve these products. 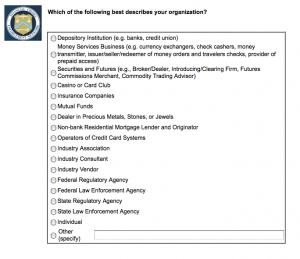 The results of the survey will be reported to FinCEN only in the aggregate; individual responses will be grouped anonymously along with those of other FinCEN customers.